"This tattoo is an emblem from Claude Paradin's Devises Heroïques, published in 1551. I spent a long time deciding on a tattoo and vacillated a lot. I eventually settled on this one because (aside from the aesthetics) it spoke to me while I was facing and processing some really heavy stuff, and I realized that I saw my past, present, and future in these birds struck through with an arrow--each mortally wounded through the breast, but not dead, still flying with their heads lifted. The tattoo was done by Jeny Ann Kennedy (@jenyannkennedy) at Evergreen Tattoo Company (@evergreentattoocompany) in Fairbanks, AK." corporeally in a corporeal creature? I come to a series of lights in the fog. The lights fly in a halo over an island. from its feathers: a simple bird. and step into them, braced to ignite. Sara Eliza Johnson's first book, Bone Map (Milkweed Editions, 2014), was selected for the 2013 National Poetry Series. Her poetry has appeared in the Virginia Quarterly Review, Boston Review, Copper Nickel, Ninth Letter, Blackbird, Crazyhorse, Pleiades, the Best New Poets series, and Salt Hill, among others, and nonfiction has appeared in DIAGRAM. She is the recipient of a National Endowment for the Arts Fellowship, a Rona Jaffe Foundation Writers' Award, two Winter Fellowships from the Fine Arts Work Center in Provincetown, and the Philip Freund Alumni Prize from Cornell University. She currently teaches at the University of Alaska, Fairbanks. 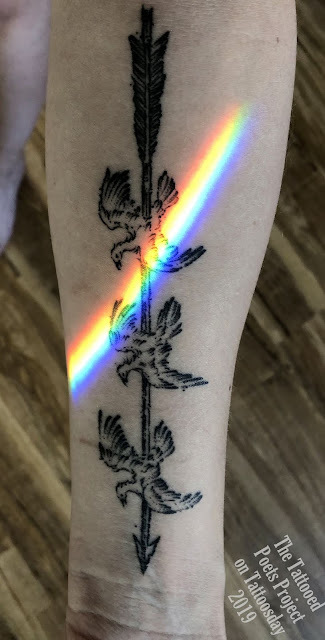 Thanks to Sara for sharing her tattoo and poem with us here on Tattoosday's Tattooed Poets Project!